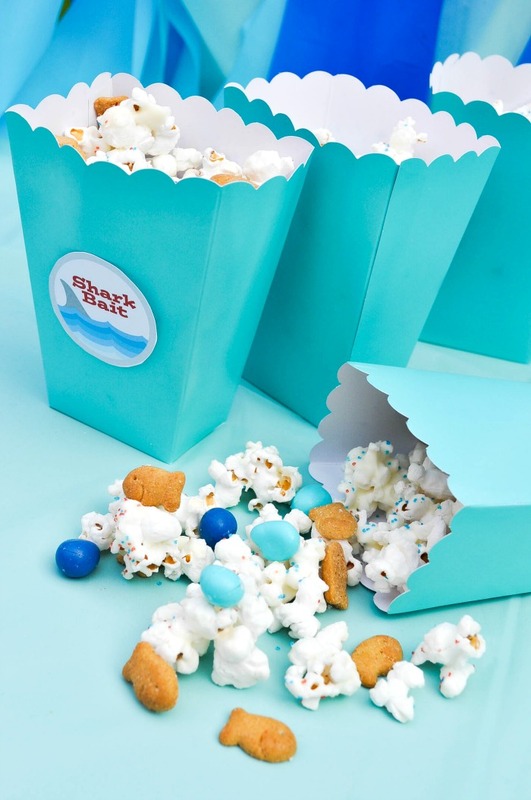 Ocean Party Popcorn Mix – A delicious addition to our Shark Party! With Shark Week on Discovery going on now and Sharknado 3 releasing in a couple weeks, I wanted to have some party fun. I pulled together a fun Shark Party that I will be sharing with you all this weekend, but in the meantime, I will be sharing some fun details! 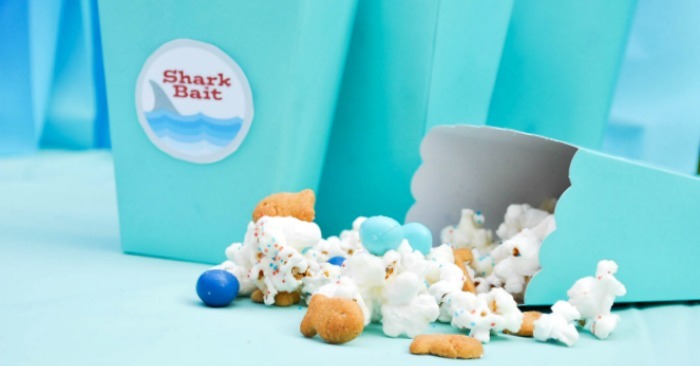 We are starting with Shark Bait, an Ocean Party Popcorn recipe! 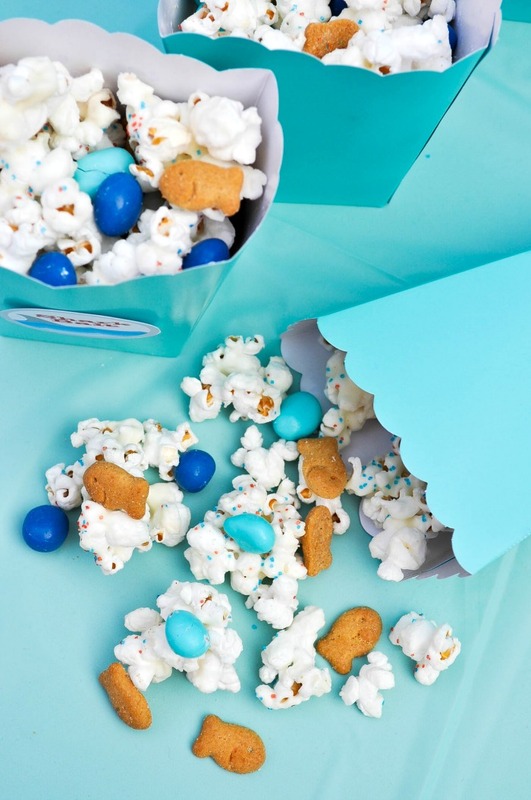 Party popcorns make a sweet snack mix that everyone will love. It has the perfect combo of salty (popcorn) and sweet (white chocolate). Plus, you can throw in some tasty goodies like M&Ms and the dessert Gold Fish. I was so excited when I found the dessert Gold Fish because it works perfect for an ocean themed party. They are also really tasty! On a large baking sheet or bowl, gently mix in the melted white candy/chocolate into the popped popcorn. Then, sprinkle the sprinkles before melted chocolate hardens. Once chocolate is dry, gently break it apart into pieces. Add candy and gold fish. Make sure to store well to keep it from going stale. Keep an eye out for more Shark Party and Ocean Party themed recipes and projects this week leading up to the big party reveal! Those treats look mightily good! As a popcornaholic I’ll be watching with my own dangerous mix: Microwave popcorn slathered with real butter, sprinkled with cayenne pepper and dried basil then topped with heaps of grated parmesan cheese (Kraft is fine but the cheaper, more flavorful brand at our local Kroger is even better). If you have a kettle popper, then skip the microwave and make tons of yellow popcorn with real theater oil (coconut), real movie theater butter-oil and Flavocal popcorn salt… it captures the genuine movie theater experience. From the Sharknado 4 Visual Effects team to you, have a great party, hope you enjoy the show!